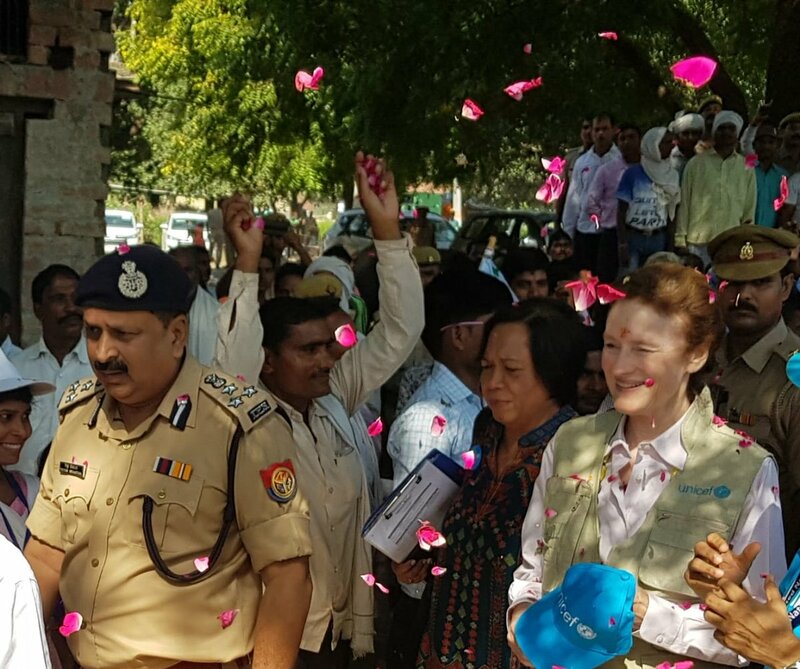 MIRZAPUR, 3 October 2018: UNICEF Executive Director Henrietta Fore visited village Ramchandrapur in district Mirzapur today on her first visit to Uttar Pradesh. Executive Director Fore met with the sanitation women champions of Ramchandrapur and joined them on a walk of pride. Accompanying Executive Director Fore was UNICEF India Representative Dr Yasmin Ali Haque and Chief of Field Office Ruth L. Leano. On 2 October, Executive Director Fore had joined Prime Minister Modi and UN Secretary General António Guterres along with leaders from over 50 countries for the Mahatma Gandhi International Sanitation Convention held in New Delhi. Executive Director Fore’s visit to Mirzapur focused on infant, young children and youth programmes. She interacted with children at the aanganwadi centre and saw the early childhood development programmes being implemented by the Integrated Child Development Services. Later she also saw a nutrition demonstration session for complementary feeding and met with young mothers. “Investing in children at the start of their lives ensures that the children develop to their fullest potential,” said UNICEF’s India Representative Dr Yasmin Ali Haque, appreciating the programme at the aanganwadi centre. “Early childhood is considered the most important phase in life, laying the foundation for physical, emotional, and intellectual wellbeing. What happens to a child in this period can determine his or her developmental trajectory through life”. Executive Director Fore and Dr Haque interacted with adolescent girls who are a powerful voice among their peers for improved Menstrual Hygiene Management. Executive Director Fore also met some women champions of Mahila Samakhya who are working towards ending child marriages and stopping violence against women. The women’s efforts have led to stopping six child marriages from March to September this year. In the afternoon, the Executive Director visited the model Sick Newborn Care Unit at the Banaras Hindu University to get a glimpse of the critical health care services for newborns. Earlier in the day in Mirzapur’s village Ramchandrapur, she had accompanied the ASHA worker Neeta Upadhyay to the home of a newborn on a home visit. Neeta along with the other frontline workers ensure that the newborns in Uttar Pradesh are provided home based care, proper growth monitoring and early identification of danger signs in the critical first month after birth. Uttar Pradesh loses approximately 165,000 newborns each year.